call of duty 4 (cod4) serveur dédié freeware Hot! Race Driver Grid patch v1.1 Hot! Call of Duty 4 - Modern Paintball mod v1.2 Hot! Call Of Duty 4 : Modern Warfare patch v1.7 Hot! call of duty 5 (cod5) serveur dédié freeware Hot! 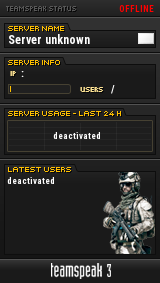 CoD4 ModernRcon Utility v0.8 freeware eng Hot! COD RconTool 11.3.1 freeware eng Hot! HDDErase v4.0 freeware eng Hot! F.E.A.R. Combat fr (freeware) Hot! Call of Duty 4 Backup v0.9.2 freeware eng Hot! Ce programme permet de réaliser des backup (sauvagrdes) de vos profil multi joueur.